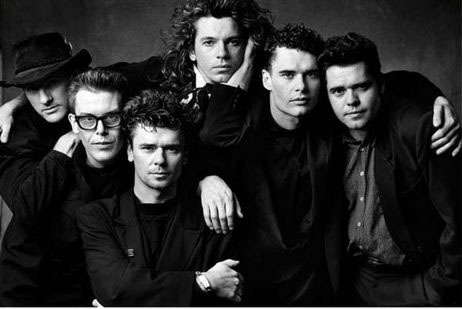 We were recently driving back to London from Oxford, when mrsdiscopop put INXS's 1987 breakthrough album Kick on the iPod. Her random selection has triggered a ridiculous nostalgiafest / spending spree, culminating in an eBay hunt for the out-of-print DVD of the band's 1991 Wembley Stadium gig, Summer XS (check out this video of Suicide Blonde from that show and tell me that Michael Hutchence wasn't the most charismatic frontman of his generation). Delving into the band's exhaustive Wikipedia page, I learned they were initially called The Vegetables, and owed a sizeable debt to the UK punk scene - particularly bands like The Clash, The Stranglers and The Buzzcocks. Don't believe me? Listen to this early single, aptly titled We Are The Vegetables. Compared to the slick rock-funk they became famous for, it's raw and exciting stuff.